Spray Jackets and Cags help to protect you from the elements. Not sure what features you're looking for check out our Cags Buyers Guide. General purpose cags are normally the entry level of the range and are perfect for summer paddling on Sit on Top Kayaks, Touring kayaks and sea kayaks. 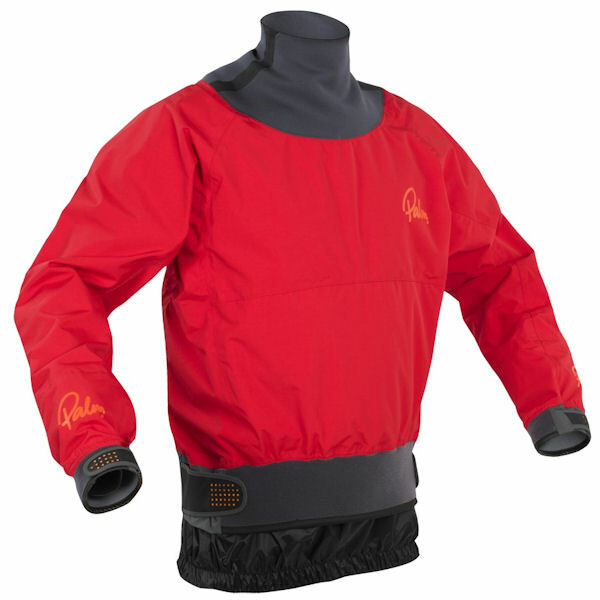 This type of jacket normally features adjustable velcro wrist and neck seals and are designed to keep the wind and spray off you, however if you do capsize water will get in quickly. A great advantage of this type of jacket is that they are easy to get on and off quickly. Not sure what features you're looking for check out our Cags Buyers Guide. The Palm Vector is a Mid weight spray jacket with adjustable cuffs and collar. Versatile mid weight jacket with latex wrist seals and opening neck collar. Cags and Jackets for Touring and Sea Kayaking are normally designed for longer paddles & will often feature a hood and latex wrist seals. This type of jacket is ideally suited for Touring, Sea Kayaking and Fishing through the colder months and a built in spray hood will provide extra protection on the water. The Adjustable neck seals that these cags normally feature are more comfortable than latex or neoprene but not as dry if you do end up capsizing, whilst latex wrist seals stop any water shooting up your arms whilst paddling. Single waist, lightweight touring cag with built in spray hood, adjustable waist and velcro adjustable wrist cuffs. The Peak Ocean Bothy is an XP 2.5 layer throw over cag. Velcro adjustable wrist cuffs, hood & pack ways small. Mid weight sea kayaking & touring cag with twin waist seal, latex wrist gaskets and stowable hood. Mid weight 2.5 layer sea kayaking cag with twin waist seal, latex wrist gaskets and detachable hood. The Peak Adventure Double cag is a fantastic feature packed ocean & sea expedition jacket. XP-3 Layer Sea Kayaking and Touring Cag with twin waist, latex wrist seals and stowable hood. Semi Dry cags are designed for whitewater kayaking and surfing but are also suitable for general purpose paddling, touring and sea kayaking use all year round. Semi dry cags feature a neoprene neck seal which is more comfortable and not as tight around your neck as a latex seal, the downside of a neoprene seal is that they are not normally as dry as latex so you may experience some water ingress if you capsize. These cags will generally feature a twin waist seal (for combining with a spraydeck) and latex wrist seals. Entry level semi dry cag with latex wrist seals and glideskin neoprene neck seal. A 2.5 layer midweight semi dry cag with latex wrist seals and neoprene neck gasket. Mid weight short sleeve cag with glideskin neoprene bicep and neck seals. Dry Cags are the warmest and driest type of jacket on the market, they are most popular for Whitewater kayaking and Surfing but can be used for any paddling discipline during even the coldest months. Full latex seals on the neck and wrist are the driest seals available and offer the best chance of staying warm and dry on the water. When combined with a good pair of dry trousers these can make a good alternative to a drysuit. Not sure what features you're looking for check out our Cags Buyers Guide. Entry Level dry cag with twin waist and latex wrist and neck seals. Features a 2.5 layer fabric with twin waist and latex neck and wrist seals. Features a 3.0 layer fabric with a latex neck, latex wrist seals and twin waist. This top end jacket features XP3 layer fabric making it one of the best whitewater dry cags. 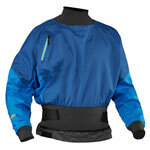 Features 4 layer waterproof fabric with twin waist, latex neck & wrists. What features should I look for in a Cag or Jacket? This type of seal is the easiest to get on and off; velcro closures mean that the seals are easily adjustable so when its cold you can fasten them tight to stop water ingressing but when its warmer you can open them up to vent hot air and keep you cool. The downside of this type of seal is that even when done up tight, water can still get in if you end up capsizing. Latex seals are the driest type you will find on a cag, their tight fit means that the seal created is very good and even when submerged little- no water will get in through them. Because of the tight fitting nature of the material, cags with latex seals are generally harder to get on and off and can cause irritation to the skin (especially neck seals when used in salt water). It is important to remember that latex seals, being made of rubber, are perishable and as such not covered under warranty- with care they will last many years but even if the seal does perish, they can be replaced cheaply. Neoprene seals vary in performance depending on model and manufacturer but generally they are easier to get on and off and more comfortable than latex seals, the downside of this is that they are not quite as dry as latex. Neoprene seals do not perish in the same way that latex can, but still rely on a tight fit to keep water out so are not adjustable and cannot be opened to vent heat. Neoprene seals are parcitularly popular for those using their jackets in salt water as it does not chafe as badly, and is more comfortable when worn for a whole days paddling. Twin waist seals are normally found on Dry, Semi Dry and more top end Sea Kayaking Cags. They are designed to be used with a spraydeck and when layered correctly (with the spraydeck waist tube between the two layers) they will reduce the amount of water which can enter the boat for the waist of the spraydeck. Sprayhoods are standard features on most of the Sea Kayaking kackets and are a great way to keep cosy and warm on the really cold and windy days. Some stow away, some are fixed as standard and on some models they are removeable; generally though they will have volume adjustment so you can get the best fit for your head size.